Priyanka had reportedly said she was often likened with Indira Gandhi because people loved the former prime minister. 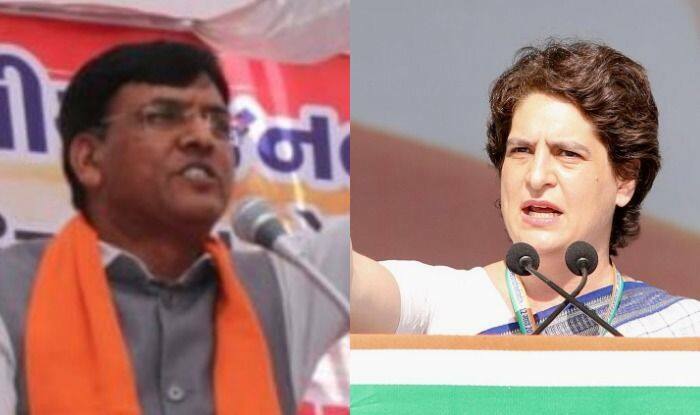 Union minister Mansukh Mandaviya on Tuesday courted controversy when he hit out at Congress general secretary Priyanka Gandhi Vadra, saying that having identical features like former prime minister Indira Gandhi did not ensure that one gets power. “It is being talked about in the Congress that she (Priyanka) has the nose like her grandmother (Indira). If you get power by having a nose like your grandmother, then won’t there be a president in every household in China?” the BJP leader asked at the party’s Vijay Sankalp rally at Anand in Gujarat. Many leaders of Congress had openly said Priyanka Gandhi Vadra reminded them of her late grandmother. Vadra, who is the Congress’ incharge of eastern Uttar Pradesh, had reportedly said she was often likened with Indira Gandhi because people loved the former prime minister. Last month, BJP MP Harish Dwivedi had also made personal comments on Vadra. Dwivedi had said Vadra wears “jeans and top” in Delhi and “saree and sindoor (vermilion)” when she is on an election campaign.